Community Download: What Do You Want From PS Move 2.0? Sorry for the hiatus! Until recently the comments on our website were down and not functioning properly, but now that they’re back and working I thought it was time to start up the discussions once again! Spurred in part by the recent release of Borderlands 2 VR on PSVR, I want to talk about the PS Move controllers. Borderlands 2 VR allows players to use the PS Move controllers instead of the DualShock 4, if they want, but it’s a less than ideal experience. 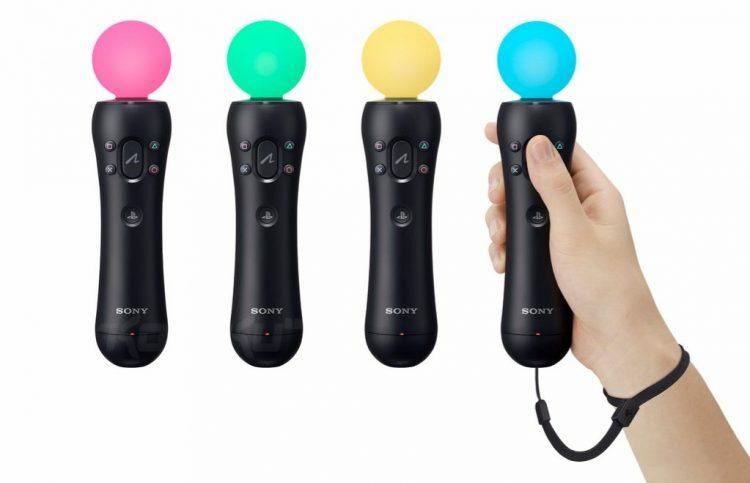 Similar to how they worked in Skyrim VR you’ve got to press a button and point your left hand to move around and press the X and O buttons on your right hand to rotate from left to right. It just feels wonky. With enough practice you can alright, as shown in my gameplay video here, but it’s less than ideal. The lack of analog sticks feels like a major missing feature. There’s also the question of ergonomics, battery life, and all of the other design considerations. We’ve seen enough patents and read enough statements to know that Sony is already working on the PlayStation 5 and probably a new iteration of the PSVR headset as well. So, with that will hopefully come brand new motion controllers. If that’s the case: What do you want out of PS Move 2.0? Are the current models enough for you, or do want/need more? What elements from Vive, Knuckles, and Touch would you want carried over to PS Move? Let us know what you think of PS Move and what you want from PS Move 2.0 down in the comments below! The post Community Download: What Do You Want From PS Move 2.0? appeared first on UploadVR. Preview: ZOLO – Zombies Only Live Once – And for Good Reason The reason is you’ll probably only play it the once. Borderlands 2 VR was the last big new VR game of the year. It just released about a week ago for PSVR and even though it lacks any of the DLC and co-op support, in addition to the PS Aim controller inexplicably not being supported, it’s still a solid and fun adventure. Borderlands 2 was already a great game and despite the issues, VR really does add to the experience. Claptrap is still as hilarious as ever. Since a lot of people will be introduced to the PSVR through this game or will be playing this game for the first time, we wanted to round up some key tips to help you get started. Borderlands 2 VR on PSVR has four basic control schemes. The most familiar for most people, especially if you played the game outside of VR previously, will be the standard DualShock 4 method. This is essentially the same as playing outside of VR, however you have added head-tracking to assist with aiming and increase immersion. But if you have a PSVR headset then chances are you want something a bit more engaging than that, which is where the PS Move comes into play. Unfortunately the PS Move controllers do not have analog sticks so no matter what you choose it’s gonna be a bit wonky. You can either have teleport only movement, full smooth movement with teleporting optional, or full smooth movement with jumping. Then on top of those options you can tweak everything from the movement and rotation speed to whether or not the field of view dims around your vision at all. If you don’t suffer from motion sickness we recommend turning all of those safeguards off like you see in the gameplay video above. The end result is something similar to Skyrim VR on PSVR, but hopefully they add PS Aim support sometime soon. Borderlands 2 VR is a looter shooter. That means that the whole game is designed around you looting brand new guns constantly every few minutes. All of the weapons are randomly generated in terms of their visual aesthetic, damage, accuracy, elemental type, rate of fire, and more so it’s extremely unlikely you’ll ever find two guns that are just alike. It’s a bit like Diablo, but in shooter form. So even if you’ve been using that same rocket launcher for a while now you should be prepared to give it up and try something new sooner rather than later. The one exception to this rule is if you’ve sunk dozens of hours into the game and grinding for specific legendary weapons that are the de facto best guns — those you might want to hang onto. The post Borderlands 2 VR: 5 Tips To Help You Survive The Wasteland Of Pandora appeared first on UploadVR. Familiarity With AR/VR Isn’t Translating Into Practical Usage These are the findings of a new survey by Artec 3D. If you’re fed up of the Christmas spirit and want to get back to the bloodthirsty videogame murderizing we enjoy for the rest of the year, then you might want to check out this new trailer for Undead Citadel. The game’s being developed by Dark Curry (great name) and appears to be a medieval-era zombie slayer. We really don’t know that much about it but the impressive visuals seen in this teaser clip caught our eye. It sounds like someone called Carnax has perhaps transported you back in time to face off with hordes of the undead. The developer says the game will focus on “physics driven close/ranged” combat. We’ll no doubt learn more about Undead Citadel in the coming year, though you can already sign up to a newsletter via the game’s official website. We also got the featured image from the developer’s own website which reveals that this team also worked on goal-saving VR game, Final Soccer. That’s quite a switch in tone. The post Undead Citadel Is A Gorgeous-Looking Medieval Zombie Slayer appeared first on UploadVR. Valve Begins Shipping its new Knuckles DV Controllers to Devs The previous EV3 prototype has seen several improvements. AR Unicorn Blippar Dives Into Administration The startup haemorrhaged to much money to stay afloat. A new update to Oculus TV adds ESPN, Sling TV, and FOX NOW. Oculus TV is an app on the Oculus Go standalone VR headset which provides a virtual TV. All 3 new services are USA-only. Additionally, from now until January 31st purchasing an Oculus Go in the US will also give you $80 of Sling TV credit, which can be used towards any of their subscription packages. ESPN includes on demand content and studio panels. With an ESPN+ subscription, you can watch live MLB, NHL, MLS, international soccer, college sports, boxing, tennis, rugby and more. Sports is arguably the most important content for any TV platform- ESPN is a major addition to Oculus TV. Sling TV is a streaming based TV serivce available on many platforms. Channels available in its various packages include Disney Channel, CNN, USA, Cartoon Network and Discovery. Sling also offers a cloud DVR service. FOX NOW allows viewing shows like The Simpsons, Family Guy, Hell’s Kitchen, and Empire. By logging in with your TV provider, you can watch FOX Sports. When Oculus TV was first announced at Facebook’s F8 conference back in May, the company claimed that it would get a social viewing feature so you could watch these shows with your friends. That hasn’t materialised yet, and no statement on the timeline for that has been given. In fact, the wording has even been removed from the original announcement post. The lack of social means Oculus TV doesn’t take advantage of one of VR’s main strengths. But regardless, the ability to use the Go as a portable big screen TV is compelling in itself. The post ESPN, Sling TV, FOX NOW Come To Oculus Go’s Virtual TV App appeared first on UploadVR. The post Oculus Rift & Oculus Go Are $349 And $179 Again, This Time For Christmas appeared first on UploadVR. Tomorrow, on December 18th, 2018, First Contact Entertainment are releasing a new map for all Firewall Zero Hour players free of charge. The new location is called Containment and takes place in a medical research facility that looks like the type of place where a zombie outbreak might start — but don’t worry, no zombies in this game yet. Just like all other maps, Containment will feature the same single game mode in which two teams of four must fight over possession of an encrypted laptop. The attacking team is tasked with hacking firewall access points to discover the laptop’s location and hack into it, while the defending team must stop the attackers or hold out until the timer runs out. Recently, Firewall Zero Hour was also updated with a new Contractor character, Nash, as well as a slew of new weapons, skins, trinkets, customization options, and more. If the studio can keep up this release cadence of offering new content (especially maps and hopefully more game modes) then Firewall Zero Hour could enjoy a long and happy life cycle for PSVR players. Let us know what you think of the new map from the trailer above down in the comments below! The post New Firewall Zero Hour Map Coming Dec. 18 For Free appeared first on UploadVR. Livestream Schedule For Week Of 12/17/18: Borderlands, Firewall, and More! Did you know we stream games over on Twitch? We’re getting into a rhythm that will allow us to stream VR games each and every weekday (except in the case of holidays or traveling for events of course) and we’re having a lot of fun doing it. We’ve moved all of our VR game streams to Twitch and want you to help us build a community. Every Monday we will post a new Livestream Schedule for the week. You can click here to see all past livestream archives and scheduled streams. This way everyone can anticipate what’s coming for the week and know when to tune in. If you have suggestions for games you want to see us stream next, leave those ideas down in the comments below! We’ll embed archived versions of each stream after they’re done and if we’re live right now when you’re reading this then you can watch right here. Firewall Zero Hour is getting a new map this day! It only makes sense to return to the excellent PSVR-exclusive tactical team-based shooter to put it through its paces once again. We streamed it a day before its release last week after publishing our review and had so much fun we thought we’d do it again. What do you want to see us do next in Pandora while playing Borderlands 2 VR? WipEout Omega Collection VR isn’t just one of the best PSVR games of the year, it’s one of the best VR racing games or even VR games ever made, period. I’ll be hitting the tracks with my partner, Jamie Feltham, to see just how fast we can go. Finally, to close out the week before taking a long Holiday break into next week, we’ll do some Beat Saber on PC with a twist: we’re only going to play custom holiday songs! Maybe with a few other favorites mixed in as well. If you have suggestions for games you want to see us stream next, leave those ideas down in the comments below! The post Livestream Schedule For Week Of 12/17/18: Borderlands, Firewall, and More! appeared first on UploadVR. The post AI-Therapist Helps Alleviate Hot Flashes In VR appeared first on VRScout. I hate roller coasters. Despite my appreciation for their architecture and my love of other less intense parts of theme parks, I’ve never been able to get on a coaster without it devolving into an exercise in how tightly I can shut my eyes and how much I can renew my faith in a deity to make the ride stop. That being said, I’ve had a fondness for the RollerCoaster Tycoon series since I was young, and I loved subjecting others to the terror I felt when I got on one of the twisted mountains of metal. With Rollercoaster Tycoon Joyride, I was finally able to leave my fear of roller coasters behind me and experience all the dips and turns in VR, and though it certainly does that job admirably, Atari and developer Nvizzio Creations haven’t perfected everything surrounding it. Despite advertising PlayStation VR support, most of RollerCoaster Tycoon Joyride is only playable on a traditional display. Across a few different modes – “missions” and “sandbox” being the two most prominent – you design your own coasters, complete with loops, upside down segments, twists, and anything else you’d expect to see at a real theme park. Limiting this to the television was presumably done to avoid giving you a headache while you’re planning your coaster’s design, but the camera angles you’re given are pretty atrocious. You can either be directly on top of the track as if you were riding it, or zoomed out above or to the side. None of them give you a great view of what you’re doing, which often results in needing to delete sections of track and start over. You’re limited to a single coaster on one of the game’s two environments, though both the canyon and the city provide enough variety in their design to make it worthwhile to experiment. An “autocomplete” function is also offered if you want to get to riding more quickly, though I found it to be useless much of the time, unable to finish even small sections of track that I didn’t want to design. But it’s after the coaster is completed that RollerCoaster Tycoon Joyride really sells itself. Armed with a blaster (think Buzz Lightyear’s Space Ranger Spin at Disney World) you ride the entire length of the coaster and fire at floating orbs along the way. Some are worth more points than others, there are power-ups and multiplier orbs to increase your total further, as well as electrified gates and bombs to decrease it. With a slow-motion ability, you can briefly get a better shot at your targets, but doing this takes away much of the fun of being on a coaster in the first place. It’s a bit reminiscent of the coaster shooter focused PC VR game RollerForce. The post Rollercoaster Tycoon Joyride Review: Limited VR Thrills appeared first on UploadVR. Oculus founder Palmer Luckey modified an Oculus Go VR headset to improve the weight distribution, increase the battery life, and allow for battery swapping. He also changed its “mainstream-friendly gray” to a matte black. He posted a list of instructions for this modification on his personal blog. Luckey explained the change from gray to black was mainly for the facial interface, so that less light would reflect off it. He claims that it reduces “god rays” — internal reflections seen as distracting visual artifacts in VR. Oculus Go’s new lenses already have greatly reduced god rays compared to the Oculus Rift, so we’re very curious to see them with a black facial interface. Luckey also completely changed the battery and cooling system. The Oculus Go normally weighs just over 400g. Luckey claims that his modifications have gotten it down to 280g by removing the original 2600mAh battery built into the Go and replacing it with a bigger 3500mAh cell attached to the top strap. The new battery connects to the top of the headset by a wire with a magnetic pogo-pin connector. Not only does this remove weight from the frontbox, but it also allows for swapping the battery to eliminate the need to wait for recharging. He also removed the existing passive cooling heatpipe of the Go and replaced it with a shorter and lighter one connected to aluminium fins which are cooled by a small fan. Luckey also replaced the aluminium frontplate of the headset with a tinted plastic, saving even more weight. In the blog post, Luckey also showed off another creation: a keyboard with a Windows 10 compute stick built into it. This mini PC runs Virtual Desktop mobile’s streamer software. When combined with an Oculus Go, this means it can be used as a laptop replacement. We’ll also note that Oculus technical leader John Carmack made his own modifications to his Go which he posted on Twitter, writing that VR headsets “can and should get much smaller and lighter”. The post Palmer Luckey’s Modified Oculus Go: Larger Battery, Improved Weight Distribution, Fewer God Rays appeared first on UploadVR. Firefighters Are Using the Latest AR Tech to Save Lives California's Menlo Park Fire Department has been using DJI and Epson kit.